Is a Super Volcano eruption imminent. Luxury Preppers seem to think so? Is a Super Volcano eruption imminent? Volcanoes and Volcanic activity have made the headlines especially lately in 2016. This article takes a closer look at Volcanoes, especially the threat of Super Volcanoes, their destructive history, is there mega activity in 2016 and what's going on behind the scenes in the luxury Prepper stakes with the worlds elite. Is their increased interest in remote bunkers? that also has been emerging more frequently in connection with earthquakes as well around the globe. The thing is you can't use El Nino as an explanation for increased Volcanic or even Earthquake activity. Something is going on with our planet......but what? Some statistics below giving volcanic activity going back to the dark ages. Is this increased volcanic activity something to be concerned about or are we seeing just a normal amount of activity but concentrated over a shorter timeline? Are the eruptions we are witnessing the sign of the possibility of another Super Volcano eruption such as Krakatoa that happened way way back in the day. Volcanoes and Earthquakes share some similarities but Volcano activity is a completely different beast to earthquakes. Volcanoes are much slower, can lay dormant for years and then spring back to life, but they normally always give plenty of warning but their destructive power is still a force to be reckoned with, and just like other natural disasters of epic proportions even in this modern day and age, we still have no control over our natural environment, all you can do is run for cover. The classic volcanic eruption photo is molten rock and lava spewing from a mountain into the sky and lava flows making their way down the side of the mountain. If you've seen the film The Lord of the Rings The Return of the King in the closing sequences, you'll get the idea. The impact of such activity is normally limited in effect on the population at large, as Volcanoes tend to be located in low population density areas for obvious reasons. It's also easier to react to such a Volcanic eruption, there's plenty of warning, you can't miss it, plenty of time to react and prepare to evacuate especially when it comes to lava flows as they are very slow moving. Unfortunately if a lava flow is heading your way all you can do is one thing.....EVACUATE! The classic lava volcanic eruption is the headline grabber the one that is not so dramatic but deadlier is the eruption that spews ash and dust into the atmosphere sometimes a couple of kilometres into the sky. Mt St Helens in the US is one of the most recent that springs to mind. This causes more disruption because the problem becomes airborne. With Mt St Helens, air traffic was affected and had to be diverted for a long time, the immediate area had to be evacuated and the after effects lasted for months with everything covered in a thick layer of dust and ash. It also blocked out the sun for a considerable period of time affecting all life forms in a vast area surrounding Mt St Helens. The Yellowstone Super Volcano Eruption just waiting to happen? Now you know why the recent large number of volcanoes becoming active as mentioned in the recent headlines is a cause for concern. Such activity suggests that a Super Volcano is waiting to erupt which would be worse than the Mt St Helen's event, much worse. That's the potential disruption that is being forecast, nobody knows when it's coming, but it is coming......that's all that is known, but all the classic warning signs are there. What can you do if you are in the danger zone. Two words.....Prepare and Evacuate. No plant, animal or human life in the vincinity of the eruption will survive. Researchers with the U.S.G.S. say that the last time the volcano erupted was some 640,000 years ago. They also say that this Super Volcano has the potential to spew more than 240 cubic miles of magma across Montana, Idaho and Wyoming with global effects. 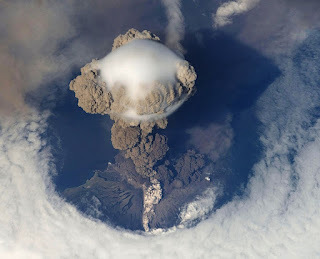 Scientists do believe that it will erupt again one day, but do not know when. Experts say a new major eruption of Yellowstone could be about 2,000 times as powerful as Washington’s Mount St. Helens’ 1980 eruption. A recent video delving into the world of luxury prepping and underground bunkers seems to demonstrate that there is an increased amount of interest in these facilities from the Wealthy 1%. There seems to be increasing concerns from this group of people that a mega natural disaster is imminent or some form of civil unrest or breakdown of society, possibly on a global scale is on the cards. It seems there attitude is invest their money in these facilities, to hell with the rest of the world and emerge a year or so later as the new Adam and Eve? How about leaving some money behind to help the general population? It will not be much use in an Apocalyptic scenario. Those thoughts don't even seem to enter into the equation. If you've ever seen the film Titanic, there's a scene with a wealthy man who wants to get on the lifeboat as the ship is sinking, but it's women and children and only. He offers vast sums of money to get on one of those lifeboats, but he realises his money is useless. I think it will be a similar situation if one of these Super Volcanoes blows it's top. The latest deployments of troops by the Russian authorities, according to reports in the conspiracy theory blogosphere, were in response to warnings by Mehran Keshe — a controversial figure revered in some online circles as an engineer who invented a revolutionary technology called “Magrav technology” — that the earthquake that recently hit the Kingdom of Tonga could be the signal of an imminent “catastrophic alignment” of the Pacific Plate. Are Preppers Prepared for this Doomsday Scenario when the Lights go OUT? Christian Prepping in these End Times?